This recipe–a zippy, tomato-based salad dressing recipe–is my adaptation of one that was handed down to my mom early on in her marriage by her Aunt Gladys. “This is the French dressing made and used in several of the Italian restaurants in the small town where I grew up, Princeton, IL,” Mom says in her notes. It has been a staple of our family for as long as I can remember. 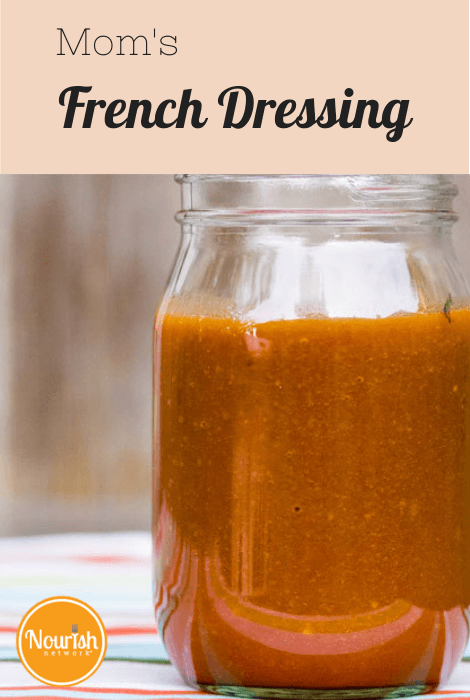 This French dressing adds peppy flavor to salads and sandwiches. Blend onion through garlic in a blender until smooth. Add ketchup and oil, season with salt, and blend again. Store in a jar in the refrigerator for up to a week.